“Good for YOU…not me” was what I always thought when I met an amazing mom that homeschooled her children. I was confident that I was both a better mother getting a break from my children, and that a fully trained individual was more qualified for the job. Yet I spent the past year homeschooling my daughter for 5th grade. Here’s our story. I love my children’s school, so much so I’ve written a post about my adoration for their teachers. My daughter is a disciplined, respectful, quiet student who takes delight in lining up her pencils and practicing her math facts. Her hard work and natural abilities have always made her successful in the classroom. Somewhere around the end of 3rd grade and the beginning of 4th she began to lose her academic sparkle. Her joy had been replaced with anxiety, and her smiles just fleeting moments. Tears became her release on matters pertaining to homework and tests. She was on edge. I remember her coming home from school with an A- on a test, sobbing for having missed 2 questions. Bummed that my then 9 year old’s quest for perfection was overtaking her ability to have a joy-filled week, I rebelliously took a pencil and drew a line through the minus turning it into a A+. “This is just a letter. It does not define you.“ She was mortified that I had defiled her paper. She needed me….but not the me she was getting. From the time we got home from after school sports until bedtime, my relationship with my 3 children was a checklist of orders: take a bath, eat dinner, do your reading and finish homework. We were stretched. I was not mentoring, modeling and even mothering in the way I thought she needed. I craved time with my daughter. I wanted that extended atmosphere where we could tackle some bigger issues like perfectionism, confidence, and identity. My concern was not necessarily where she was at now, because many children get anxious and stressed out, but where this could take her. I wanted to affirm in her who she is in Christ and that no grade, award or even imperfection can alter that identity. She is already amazing. 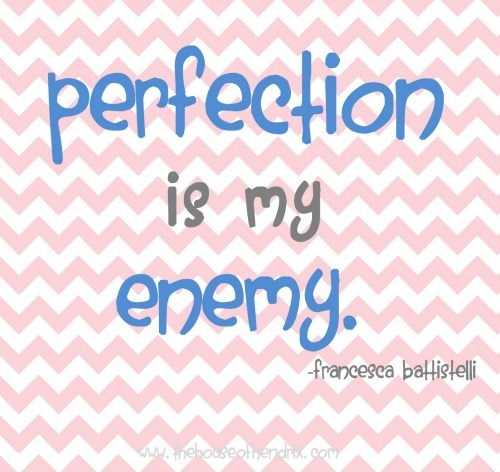 We listened to a Christian pop singer Francesca Battistelli CD with lyrics like “Perfection is my enemy. I’m free to be me.” We also read great books on that topic attached here. So I said no to a lot of good things and Yes to her. This was not a flippant decision. I gathered information, asked questions, and prayed a lot. I finally decided I would never regret taking a year to pour into her. This was not an academic decision. This was a heart decision, a commitment to each other for one year. Each morning, she made us each a cup of tea, we played classical music, and had our devotions. When we skipped this step, we ran into trouble. She craved that soothing transition from the morning rush of getting her brothers to school, to a place where our hearts were calm and teachable. We continued her Classical Christian education. We read great books, laughed, and sang. We did math at Starbucks and literature in a British accent. She was required to dance as she sang her grammar jingles and we totally dropped Latin. We learned for the love of learning. This was a journey we were going on together. I quickly saw my weaknesses revealed. I was honest and talked through them with her. Unknowingly, I was modeling bringing light to each other’s struggles…not being ashamed of them, and taking comfort in not being perfect. We don’t have to be great at everything. We are enough. We celebrated our strengths in confidence. An author who I adore, Ann Voscamp, shaped my perspective on what I wanted this year to look like. She encourages both the homeschool parent and child to be committed to living in 4 key ways. Our year together is now over, summer is coming to an end, and my daughter returns to her school in a few days. We didn’t cover everything in my curriculum plan. We didn’t take all of the field trips I imagined accompanied a homeschool experience, and I’m sure I failed to teach her everything she would have learned in school. But my daughter and I… we are connected. We’re tight! I can look at her introverted self and know the status of her heart. We built trust. We persevered through frustration. We gained confidence. We dealt with death. But more than anything, JOY returned to the face and heart of my child…a joy that is not temporary because it comes from that deep place of knowing who you are . This entry was posted in Motherhood and tagged Kids, parenting. Bookmark the permalink. Thank you so much for sharing this. It is a very powerful story I will remember for a long time. LOVE – I know you shared in an email to me why you took this year – it spoke volumes to my heart – having similar aged kids (3) time is so hard to get with each one individually…I admire your courage for doing the year with her and wish and hope that I could do the same! Awe, thanks! As moms, we do the best we can, but isn’t it hard to know sometimes how to meet all of their needs? I guess we just pray and trust God will give us the wisdom to know how. Thanks for commenting. it makes me smile. Very eloquently said! I love that you communicated through this the idea that we can approach each of our children differently to meet their own unique needs and that we should feel empowered to change directions whenever we feel inspired to do so. Wish I could take that cup of morning tea with you! I love your story. I, unfortunately am not in a financial place of being able to homeschool our daughter; but I am blessed beyond measure to be able to work at her Christian School. She too, like your child, can beat herself up when her grades don’t make her happy. I am in the process of simplifying our home so that we may spend more moments together making memories that count! Your post is re-affirming to that goal. Thank you for sharing. May you be blessed beyond measure! We are embarking on a year of unschooling!!! For many of the same reasons! Thank you so much for sharing this article. We are embarking as well on our first year of homeschool. I NEVER thought this would be an option, but like your lil’ girl – my older sons lust for learning faded and was replaced with anxiety …and w/ my lil’ ones needs we decided to give this new plan a shot. I don’t know if it’ll be a year or more but after much debate (and discouraging comments from others) we’re planning to push forward and are looking forward to the adventure! I feel the way you felt beforehand and it’s lovely to read of such positive outcomes. Alli, this is amazing. Thank you so much for sharing this journey. This is life changing. Really. Love you! Thanks for sharing your journey. As a mom to 3 beautiful girls ages 14,10 & 8. There are times in our rush,rush world that it seems like I’m no spending the quality time that I or they need. Reading your blog has touched me in a way that I know that I am the one in control of how our time is spent….Sometimes we just need to slow down and enjoy what God has given us….. Thanks for sharing again and have a Blessed Day!!! LOVED this! What a wonderful idea!! Taking that year to fully invest in your daughter will pay a lifetime of dividends, blessing you both! Thanks for sharing!! This is such a wonderful experience – I hope you continue to share it with everyone who will listen. We are all so wrapped up in ‘busy’ and being busy has become some kind of badge of honor for so many parents and people. To take the time to stop and do what your children need (and I don’t mean another scheduled activity!!) is a rarity. The courage you demonstrated by pulling your daughter out of school and doing what you knew she needed even though it went against so many conventional norms is truly inspiring. 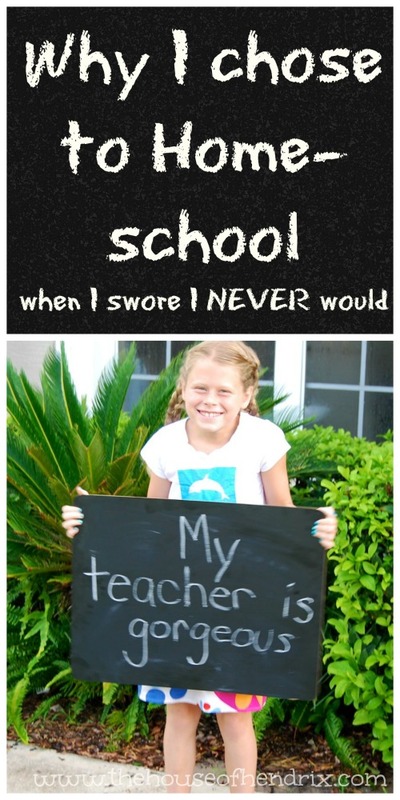 And it has hit home for me – a reminder of the #1 most important reason to continue my own homeschool journey. Thank you. What a blessing to both of you that you chose to pour into her when she needed it the most. I am featuring you on this week’s “Hearts for Home” blog hop. Can I ask why you stopped? I mean, I LOVED the part where you expressed that we should live holistically with no lines between education and home life. Do you not think her anxiety will return once she is back in the rat maze? I seriously applaud what you did to restore her self-image and teach her that perfection isn’t important, but it’s likely she will return to that anxiety-ridden state of getting perfect grades and homework and project pressure once she is back in school. It only gets harder and the higher up grades put more pressure on kids to score well on tests. I hope this one year was the answer and she continues to not let perfectionism get the best of her but I don’t see how you can tell us to live holistically, learn, explore, and seek God in his creation, then send her back to an institutionalized setting where she doesn’t get to do any of that stuff? Great question and comment Marie! I think through each of those things on a regular basis. Every year I re-evaluate what I think the best decision my kids is for that upcoming year. So it’s a year by year, child by child, decision. I also would never tell you what is right for your child, just wanted to share my experience. We took one year at home, may do it again in the future. I don’t think homeschooling is a black and white, right or wrong, area. We are blessed with a tremendous school which really focuses on the heart issues of its students. They actually teach a holistic integrated curriculum, seeking God’s creation in each subject from math to science. So she is getting to do those things you mentioned at school. I realize though not everybody has this option (or wants it) in their school choices. My daughter and I both knew she should go back. She is inspired by the routine and formality of the classroom. She missed the way they make history come alive. She missed the giggling with her friends. She is also competitive by nature and enjoys working hard for good grades. I had to learn there is nothing wrong with a competitive nature if kept in the proper perspective. I too was worried that her anxiety would return with the pressure. But I also didn’t want to remove that pressure from her life, as much as, equip her with the skills to deal with it, so that it doesn’t turn into anxiety. It was a joy to walk through life together because we walked through the stresses of life together. I hope I modeled healthy ways to deal with it. We talked a lot. Last week she had her first cross country meet ever. She was nervous and was disappointed with her results. Because we had taken a year together to have deep conversations on things like performance, we had such a great platform to start talking through her race. A year ago we would not have been able to do that in a productive way. So our year together laid a foundation and equipped her with practical ways to persevere through pressure, and when anxiety strikes…what to do. Is she going to be anxious again, absolutely. Is she going to still strive to get a “perfect” grade, yup, she really enjoys A’s. Will she struggle with her identity, yes because I think we all do. But when I tuck her in at night, we are tight. We have relationship. We have trust. We have a foundation together from which our conversations can deepen. That was my goal for our year together. We didn’t need another year because we got to where we were headed. Do I think she should have stayed home this year…100% no. She absolutely LOVES being back. I have had a dozen comments from moms and kids about how much more confident she is, and so JOYful. Would I homeschool her again next year, absolutely if I thought it was best for her. So thank you so much for your question. I needed to process it now that she’s been back for a month. Your question though really makes me thankful that she has a school environment consistent with the desires of my heart. Thank you again Marie for your insightful questions. I really appreciated them. My twelve year old daughter has been asking to be home schooled for a year now. Her first year of middle school was full of drama and bullies. Now she is in seventh grade and the drama has died down to be replaced by lots of homework and tests. She is stressed more often than not. What I struggle with, in considering homeschooling, are two things – 1. I work full time. I work from home, but I could not teach her full-time and would rely on an online school for most of her work. I am not sure this would be any better than what she has now. 2. My youngest (9) – how would I position her sister staying home when she is still going to school? I don’t think she would want to be at home and I know I don’t want her to. She is in advanced classes and involved in several clubs. I want her to have that extra stimulation and challenge that I could not provide juggling a full-time job and homeschool. How did you position homeschooling your daughter to your sons? How did you handle any jealousy they may have had? Great questions. My boys were under the understanding that we were all work and no play at home. To avoid the jealousy issue, we really downplayed it – and focused on all the things school had that home didn’t (friends, recess, pe, centers). On the few occasions that they did request “to stay home to do school”, I told them I would consider for the following year but that i only teach one child at a time. Once the routine was established, it was a non-issue. We did we included them in cool science experiments and such. Every family is different. It is challenging without a job, so working full time would be a lot. You may look into co-ops in your area where they could go to school twice a week and are home the other days. We’ve had a great experience with them. I am sure it is a year she will treasure forever! This is our first year homeschooling,and I have hopes it will bring my daughter and I closer together. I love that smile on your daughter’s face in that last picture — true happiness! That smile captured a joy that had been missing for too long. So thankful it’s back. Best of luck to you on this journey. “But more than anything, JOY returned to the face and heart of my child…a joy that is not temporary because it comes from that deep place of knowing who you are” She is very lucky to have you! I’m considering the transition as well. Although I’m not confident I can offer her as much as public schooling does. I battle issues myself, so I am still undecided. I know that I have a lot to offer my daughter, as a person… but on the days where my illness has the best of me, I feel that I won’t “be enough.” If that makes sense? On those days, consistency and schedule will be out of the window and the bare minimum will be a struggle. Savannah, every child is so different and their needs unique. 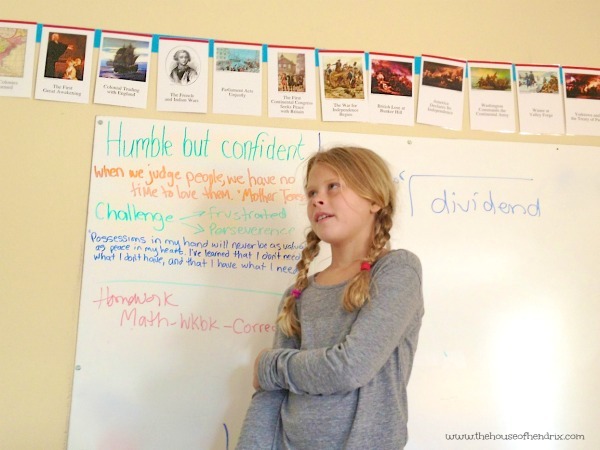 My daughter needed to confidence in who she was at a foundational level so that she would not waffle based on a grade, friendship, or body image issue. She needed affirmation that she was enough today…and perfection or success did not make her any more fabulous or lovable than she already was. We had our rough days but those were the most growing for both of us. On those challenging days, we saw each others weaknesses more clearly and had to work together to push through them. We came out of that year, so much more connected. Today she is blossoming. She laughs more, engages more, and is no longer anxious about pleasing her teachers or achieving a grade. She found balance and that was our intent. I thought it through for several months but ultimately just had to make a decision.There are pros and cons to every educational environment but I knew I would never regret spending a year with my daughter, even if we dropped the ball on a few things. As you process, think about what your daughter’s greatest needs are right now and who can best meet those. Whatever you decide, enjoy your girl.